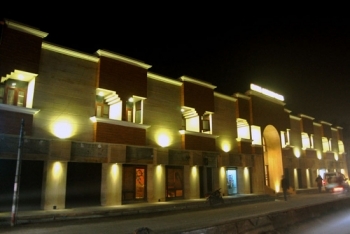 Hotel Kumaon Plaza is an affordable, deluxe hotel in kashipur and is one of the oldest hotel in Kashipur. The hotel was built in early 1990s. There is an old saying Old Is Gold, this is what you can experience at Hotel Kumaon Plaza in Kashipur. Every room at the hotel is unique in some way so that the guest can get a room according to his/her requirements. The hotel provides you a home environment, so you can experience a home away from home at the hotel. The hotel is the official host of GAIL India Pvt. Ltd, which is working on its plan to set up a Power project at Kashipur. The hotel is located at Kashipur on Nainital road on National Highway 74. It is at a distance of 170 m from Kashipur Bus stop. The hotel has total 27 rooms, including Deluxe Corporate, Super Deluxe Corporate, Garden view Heritage and Heritage Suite, all rooms with a unique feature with aminities like AC, Telephone, Mineral water etc. Enjoy mouth watering Chinese and Continental delicacies including soups and salads at Windows Multi Cuisine Restaurant. Enjoy Juhi Chawal, Shahrukh ka Shorba or Jhankar meat at Indias first bollywood inspires Star Cafe in Kashipur. Visits and excursions to nearby places is also organised. Some places of intrest are Dron Sagar Lake, Moteshwar temple, Chaiti Temple, Nainital, Jim Corbett National Park, Garjia Temple, Corbett wild life museum, Dhanagiri Museum, Corbett Fall, Bhimtal lake, Sat tal, Naukuchia Tal etc. Deluxe Corporate, Super Deluxe Corporate, Garden view Heritage and Heritage Suit rooms are available and rates are on requests. By Bus: Direct buses are available for Kashipur from Dehradun, Delhi and Haridwar. Dehradun is at a distance of 238 kms from Kashipur, Delhi at a distance of 220 kms and Haridwar at a distance of 177 Kms. You can hire a cab also to reach Kashipur. By Air: Nearest Airport to Kashipur is Pantnagar, at a distance of 68 Kms. You can board a flight for Pantnagar from Delhi on Monday, Wednesday or Friday. You will easily get a taxi for Kashipur from there. By Train: Udhamsingh Nagar is the nearest Railway Station to Kashipur at a distance of 2 Kms. You can board a train to Udhamsingh Nagar and cover the remaining distance of 2 Kms from Taxi.